Roomy and good value accommodation with either downstairs terrace or upstairs with private balcony. The bedroom leads to a bright sizeable open bathroom with a garden and indoor and outdoor showers. Superior rooms are available with double or twin share and additional beds or cots can be placed and offers interconnecting options. These rooms are suitable for families or couples seeking a good value larger room. Essentials Air conditioning and fans Double or twin beds Daybed can be used as single bed up to 12 years Extra single bed or cot can be added Twin rooms & interconnecting available Safety deposit box Flat screen TV Satellite television stations Outdoor standing shower Indoor standing shower Bathrobes & hair dryer Mini bar Bathtub. 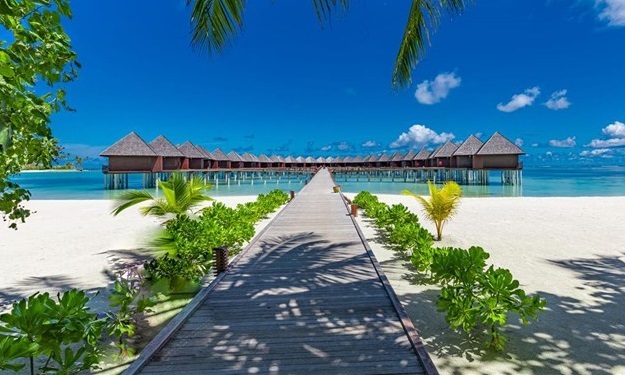 Thoughtful Touches Beach slippers, beach bag Supersized beach towels Aromatherapy based amenities Tea & coffee making facilities, Complimentary internet connection Maximum Occupancy 2 adults 1 child.Twin rooms available upon request and subject to availability. 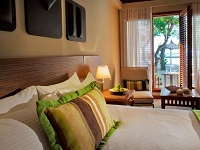 Well located rooms on the Western side of the island near a beautiful stretch of beach, lagoon and fringing coral reef. The Deluxe rooms are comfortably appointed and decorated, featuring a large bathroom with partially open shower and separate tub. These rooms are perfect for couples who are seeking a more peaceful location.Essentials: Air conditioning and fans, Double or twin beds, Twin rooms & interconnecting available, Safety deposit box, Flat screen TV, Satellite television stations, Partially open shower, Bathrobes & hair dryer, Mini bar, Bathtub, Interconnecting rooms available, Beach slippers, beach bags, Supersized beach towels, Aromatherapy based amenities, Tea & coffee making facilities, Hot chocolate, Make your own cocktail bar. 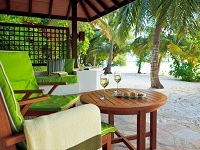 Deluxe Bungalows dot the island and are nestled amongst tropical gardens. These are within a short stroll from the beach with ocean views. A sizable outdoor balcony with day bed makes for quiet afternoons enjoying the sea breeze that flow onto the white sand of the island. The high-ceilinged bedroom is spacious with an indoor daybed, flat screen TV and work desk. A spacious open bathroom complete with two washbasins, a glass-walled indoor shower, a free-standing bathtub and an open-air sand and stone-floored shower garden. These rooms are spacious and offer a range of thoughtful touches. Essentials Air conditioning and fans Double or twin beds Extra single bed or cot can be added Safety deposit box Flat screen TV Satellite television stations Outdoor standing shower Indoor standing shower Bathrobes & hair dryer Mini bar Double vanity Bathtub. Thoughtful Touches Beach slippers, beach bag Supersized beach towels Aromatherapy based amenities Tea, coffee & hot chocolate making facilities. These rooms are well appointed and offer a large balcony with panoramic ocean views and daybed those steps onto the white sandy beach. The high-ceiling bedroom is open and airy. A spacious bathroom complete with two washbasins, a glass-walled shower, a free-standing bathtub and an open-air sand and stone-floor shower garden. Guests staying in the Beachfront Deluxe Bungalow enjoy the option of having Premium à la carte breakfast in Ocean Grill plus a range of thoughtful touches. Set in tropical gardens, these villas provide a roomy bedroom and sitting room, perfect for families and couples who desire a spacious getaway. Large open bathrooms feature a glass-walled shower, separate bathtub and an open courtyard complete with a “rain shower” and a private outdoor Jacuzzi. There is a large wardrobe and private bar. The living space lounges can be suitable for additional bedding or a space to relax and read a book or watch a DVD. 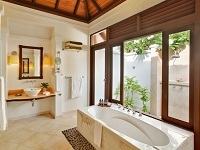 Family villas have a delightful range of thoughtful touches. 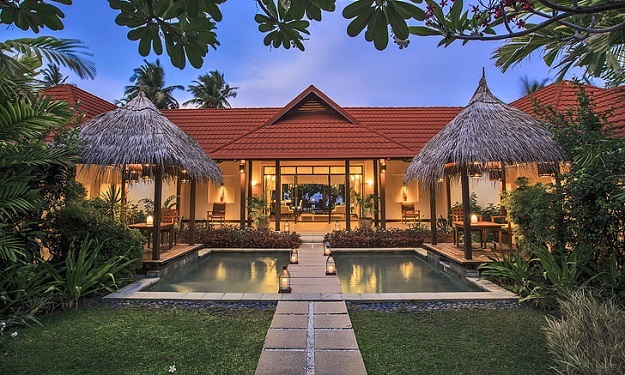 The Private Villas are idyllically located on prime beachfront and are consistently the favorite choice for guests seeking spacious comfort and privacy. Featuring a large bedroom, adjoining sitting room and verandah steps away from the beach, the villa is also complemented with a spacious bathroom, a glass-walled shower, bath tub and open courtyard complete with a "rain shower" with an outdoor garden Jacuzzi. 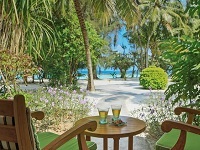 Guests staying in the Private Villas enjoy the option of having Premium à la carte breakfast in Ocean Grill, daily afternoon cocktails in the Beach Bar plus a range of thoughtful touches. 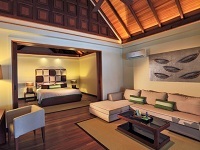 The spacious Pool Villas feature a large bedroom, sitting room and verandah that lead onto the white sands of our island. A private courtyard features a swimming pool, complete with Jacuzzi, set in a peaceful garden with a thatched roof daybed pavilion for relaxation and sunning decks with sun loungers. The rooms are large and open allowing for spacious living. Thoughtful touches include Lavazza coffee machines, I-Home docking station and DVD player to name just a few. Guests staying in the Pool Villas enjoy the option of having Premium à la carte breakfast in Ocean Grill, daily afternoon cocktails in the Beach Bar plus a range of thoughtful touches. 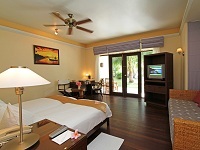 The Presidential Villas are tastefully appointed to ensure your privacy and comfort throughout your stay. There is a master bedroom on the upper level with a king-sized bed overlooking the beach and ocean. This level also features a walk-in dressing room, bathroom with separate glass-walled shower, central marble-sided bathtub and outdoor shower. 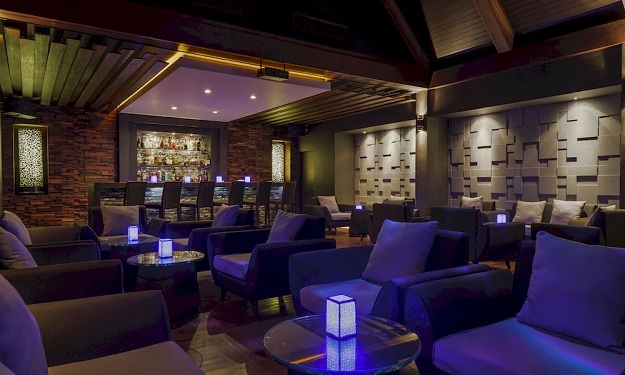 The downstairs space offers a large lounge room with private bar, television and sound system facilities. 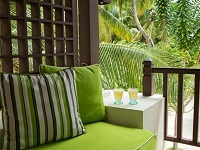 The ground floor verandah leads out to the beach and lagoon. There is a large private swimming pool in an enclosed courtyard with dining table, sun loungers and or daybeds. This room can be suitable for families or romantic couples seeking privacy, space and a touch of class. A highlight of luxurious living, the Royal Residence is a two-bedroom suite with two swimming pools and a spacious sundeck overlooking the beach. The entrance is through a courtyard over a bridge spanning an ornamental pool with a thatched pavilion and daybeds on either side. A patio gives access to a foyer and large sitting room, complete with butler's pantry and guest washroom. 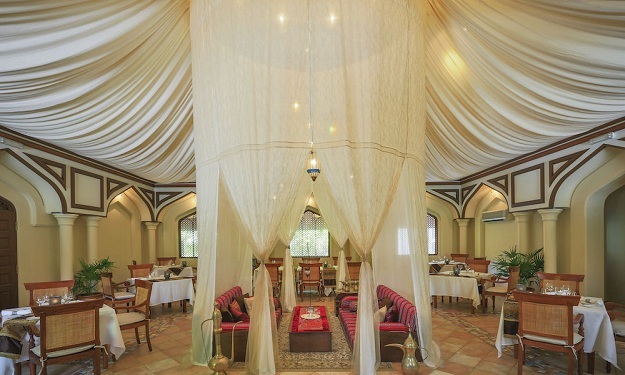 Doors on either side of the foyer open into the two wings of the Royal Residence; each wing has a walk-in dressing room, bedroom with king-sized bed, verandah onto the beach and a large, luxurious bathroom leading to a private courtyard with swimming pool, Jacuzzi, outdoor shower and shaded king-sized daybed. The lounge and diner area serves as a central space for entertaining or dining. 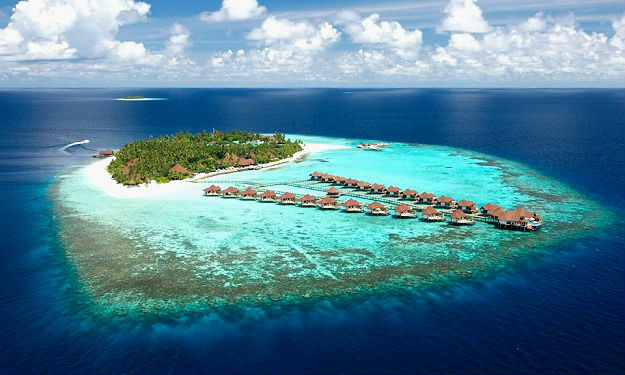 Set in the lush gardens of Kurumba Maldives, Veli Spa is a true Maldivian experience. 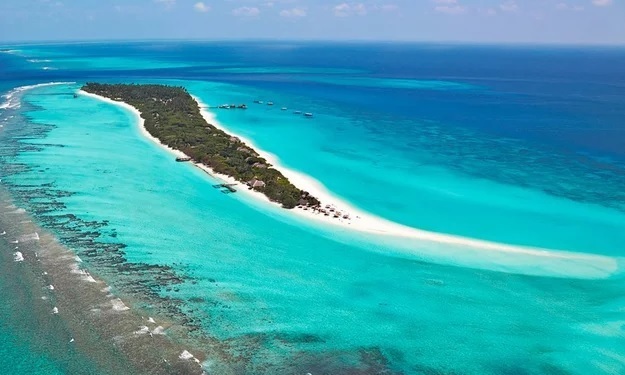 The soul of Veli Spa is inspired the solace of the Islands, the balance of the oceans, the energy of the indigenous people of the Maldives and the healing effects of human touch while incorporating traditional Maldivian therapies. 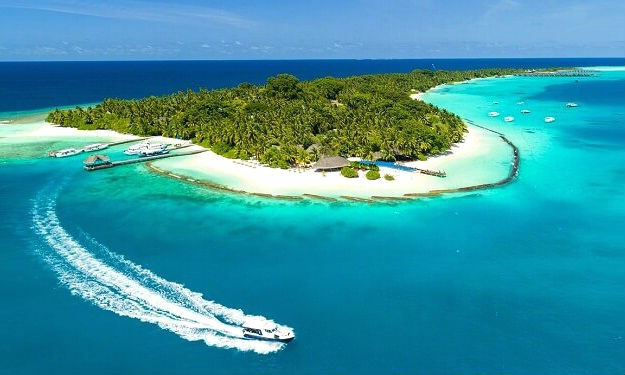 Euro Divers offers diving at Kurumba Maldives and many of the best dive sites in the region are within a 5 -30 minute boat trip from the resort. 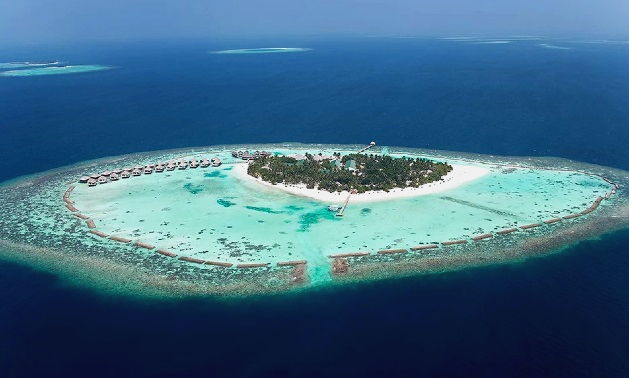 Dive sites to explore include Manta Point, wreck dives and some of the best drift dives in The Maldives. 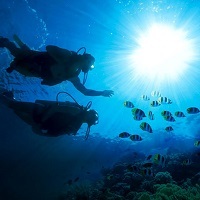 The dive centre is fully equipped with state of the art dive gear and nitrox. The speedboat driver glances back with a broad grin. Then the roar of engines. Hang on for dear life. Laughter and shrieks of excitement fill the air. A rainbow spray of water. Cutting through the waves, free as a bird. 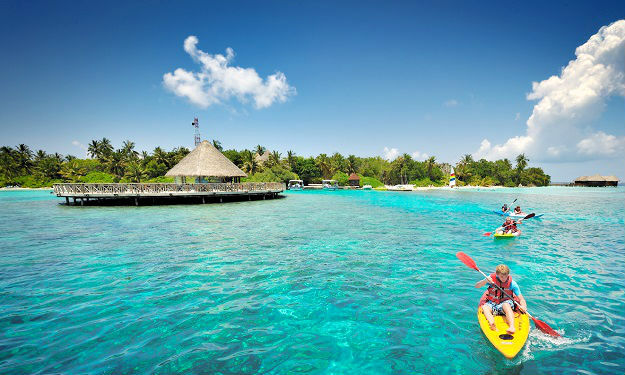 Paddle across the atoll in a kayak. Ride a strong gust on a clear morning. Balance on a catamaran. Parasailing, wakeboarding, jet skiing. 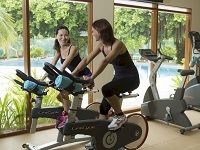 An array of watersports activities and facilities to indulge in. So many ways to soar. Sunset & Dolphin Discovery Cruise: Experience a relaxing cruise in search of wild dolphins while viewing the sun setting over the Indian Ocean. 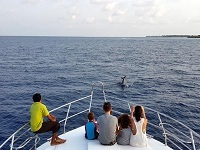 The Maldives is home to several species of dolphins, which can be seen gracing the waters near Kurumba. Watch them jumping and doing their friendly tricks as they frolic and play in the wake of our boat. 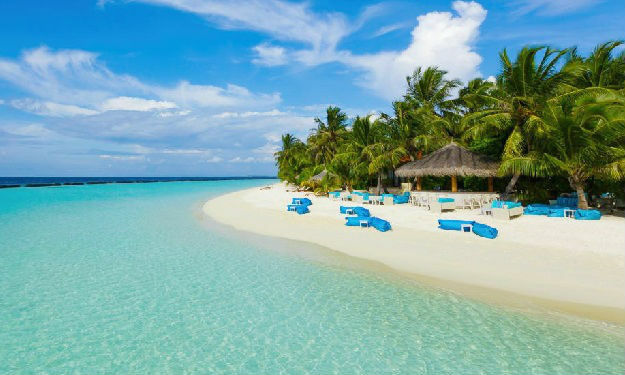 This is one of the most fun-filled and moving excursions you can experience while in the Maldives, and will create lasting memories for years to come. Sunset Fishing: Experience sunset across the ocean while you cast your line to pursue the fish below. We prefer catch and release though there is a policy of no more than one fish per person to help sustain the local environment. All guests agree to support our environmentally considerate fishing policy regarding minimum fish sizes. Weddings Renew your vows in paradise with sand beneath your feet and wind in your hair, live a timeless moment when you are one with nature. 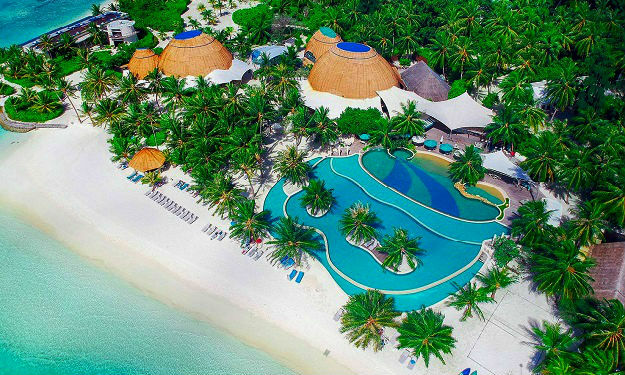 Kurumba offers you one of the most stunning Maldives wedding venues along with a host of distinguished services and facilities to ensure a memorable event. 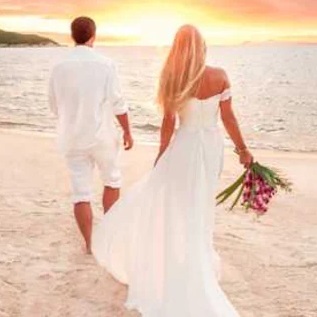 You may choose to perform your ceremony on a white sandy beach or in private gazebo overlooking the waters. Just the two of you and the sounds of the sea. The stars above. Sumptuous courses arrive, one after the other. Fresh tuna carpaccio, braised rack of lamb. Thoughtfully matched fine wines. On the island’s western end, perfectly angled. Arrive just in time, order a light snack. A cocktail to hand, barefoot luxury, sand beneath your feet. You sit back. Dazzling colours over the Indian Ocean. A magnificent sunset. Quiet all around, except for the whispering tide. Laid-back dining, opposite the pool. 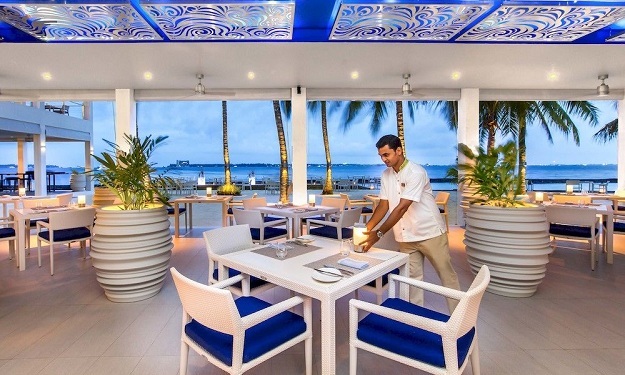 Varied snacks arrive, playful Maldivian dishes, zesty chutneys. Scrumptious sandwiches, hamburgers, comfort foods. Stop in for a quick bite, or leisurely all-day dining. Carefree meals at poolside tables. Savour homemade ice cream, dessert heaven, as you watch the waves. The best traditional Italian dishes with a twist. A contemporary dining experience in a relaxed atmosphere. Open wine racks with Italian labels. 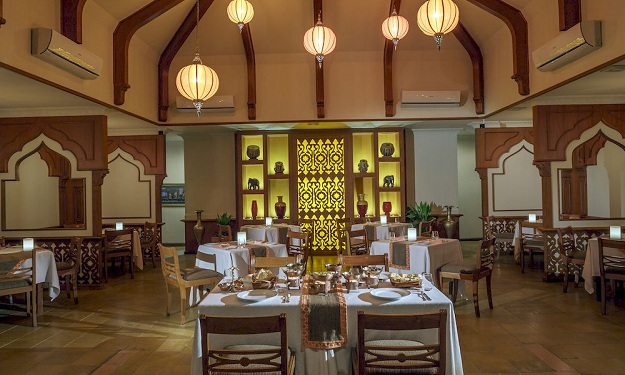 Flavours from the East, influenced by the oriental countries of China, Vietnam and a touch of Thailand. Set in an inspired Asian backdrop and offering an array of shared and individual dishes. The glitter of red and gold. The intoxicating scent of incense. Authentic recipes, from the far reaches of Northern India. An emphasis on savoury. You agonise over the menu, so much to choose from. Bright tandooris, rich curries, buttery naan and syrupy desserts. From mouth-numbing to mild, delighting everyone. Middle Eastern specialities. A stately ambiance. ‘The Palace’ lives up to its name. Charcoal grilled meats, juicy kebabs, mezze, intriguing dips. A selection spanning Tunisian, Lebanese and Moroccan. 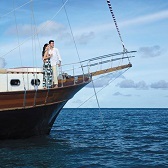 Kurumba’s ‘Ocean Wind’. Flames leap, mouth-watering teppanyaki sizzles. Colourful sushi and sashimi platters. The chef shares his favourite maki roll recipe. 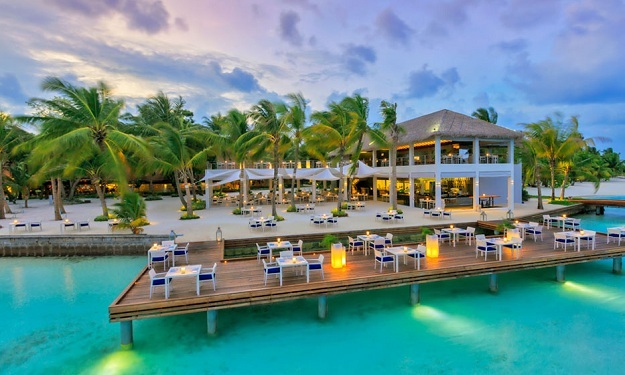 A lively and sumptuous dining experience in overwater restaurant. Start the day with free-flowing sparkling. Refreshing tropical fruits and cold cuts, elegantly served. Delight in flaky pastries, freshly squeezed juices. Enjoy Eggs Benedict, crêpes and a range of made-to-order options. Over dinner, vast sea views. Bites of succulent lobster and tiger prawns. Savoury spices and salt. 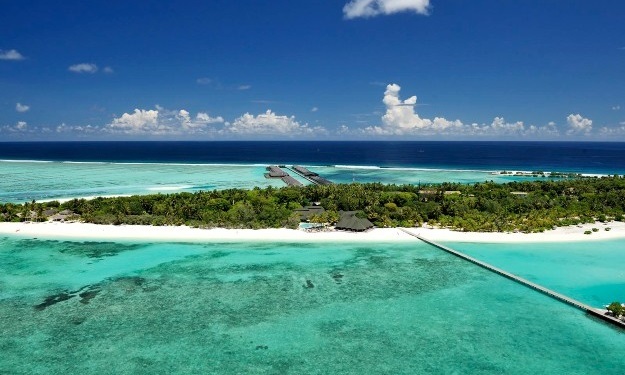 Earthy Maldivian flavours, culinary wisdom deep as the Indian Ocean. Breezy alfresco dining in the company of friends or family, beachside or perched over water. Breakfast. The aroma of home comforts. Freshly baked bread. You smell the waffles before you see them. An omelette frying in the pan, just the way you like it. By night, a tasty feast. Japanese delicacies. Hearty Italian. Fiery Indian curries. Local Maldivian dishes. Each day is different, each cuisine memorable.